Home Scandal and Gossip Robin Williams dead. Why did he commit suicide? Asphyxia reported. Why did the actor kill himself? Robin Williams has today at the age of 63 been found dead the believed result of a suicide attempt on his own life after a long bout with depression. The much beloved actor’s publicist, would issue a statement only to tell that the California based actor had been battling severe depression. He had only returned to rehab this past July after been clean for 20 years. The dallasnews would tell that Robin Williams was a recovering cocaine addict and alcoholic and had recently checked into a rehabilitation center. It is believed the actor’s attempt on his own life came today circa noon after a 911 call about Williams was made from the family home. At present the Sheriff’s Office Coroner Division suspects the death to be a suicide due to asphyxia but were awaiting the results of more tests. Told Marin County sheriff‘s office: ‘A comprehensive investigation must be completed before a final determination is made” on the actor’s cause of death. The actor was best known for his starring roles in classic comedies like Mrs. Doubtfire and Jumanji. Along the way he won the Academy Award for Best Supporting Actor for his portrayal of Dr. Sean Maguire in Good Will Hunting. He rose to fame while playing Mork the alien in the TV show Mork & Mindy, a Happy Days spinoff. Most recently, Williams had starred in the new CBS sitcom ‘The Crazy Ones.‘ It was cancelled after just one season. The performer had sought treatment for alcohol addiction and substance abuse in the past. In 1988, he told People magazine that he had had used cocaine ‘to hide,’ but had quit when his first wife, Valerie Velardi, became pregnant with their son, Zachary. Though Williams was most celebrated for his acting career, he is also remembered his charitable endeavors. A strong supporter of the St. Jude Children’s Research Hospital, Williams also spearheads Comic Relief, which raises money to help the homeless. He was also an avid gamer and named his daughter Zelda. Here is the full press release on his death, courtesy of Marin PD. In the end we have to wonder what compelled Robin Williams to call time out? Was there foul play? Demands being made on his time, schedule, work related (his last show had been cancelled but why?) and why hadn’t there been anyone in the end the actor could turn to? Had the weight of his being, the gulf between his public persona and the way he secretly felt about himself become too much to bear? Or was it simply the ache of depression, that the actor finally capitulated to…? 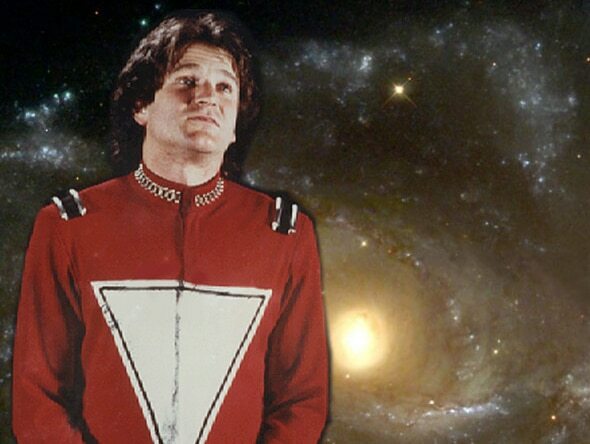 Mork: Here’s the paradox sir because if they did get together, they wouldn’t need one. Isn’t that zenlack? Bobbie Wygant Interviews Robin Williams for “The World According to Garp” 7/17/82 from Erik Clapp Cinema+Photo on Vimeo. Be a hero in somebody’s life if you know they are suffering from depression, because depression kills.Robin Williams entertained us across a Universe of genres. In person, Robin was genuine, the real deal, a ball of human complexities, the full range of human and sometimes animal, emotion. He put it all out there, raw and edgy. Robin gave and gave, but behind the giving was great pain and despair that was oft times unwieldy and uncontrollable. In a world filled with great sorrow, Robin’s mission in life was to lighten our load so that we could laugh rather than cry past our human frailties and challenges. Robin loved people, and with each person he connected at a soul level that rare few ever do in this life. How can we forget Robin? We can’t. The world is stun, in complete shock. Everyone thinks and remembers Robin Williams in a favorable light, with his characterizations throughout a lifetime reaching others across the lines of generations, touching lives in personal, relatable ways. I hope Robin can see from the other side of the veil, how truly loved and relevant he is and was in each one of our lives. Our thoughts and prayers are lovingly extended to Robin, his family, friends, and the millions of fans around the world. May his passing bring to light the ravages of depression, and encouraging more focus in access, treatment, and us having compassionate conversations with one another in preventing self harm.